as if you might listen. that all of us are victims of each other? Today the victim’s Jane, tomorrow John. exploitable affront within our fiefdoms. and sip the milk of truth, if not wisdom. who struck another of a foggy morning. and therefore void of consciousness or story. and so did she. What more is there to say? A few new poems underwhelm, such as “Early Retirement” and “My First Taste of Sherry,” as they find Howard sentimental; for this reader at least, both poems stall out at wistfulness. “While Waiting for the Doctor,” another unfulfilling poem, engages us a vivid, anxiety-ridden scene of a patient’s thumb-twirling—replete with tongue depressors and cotton swabs—but fails to develop, and ultimately deflates with an uncharacteristically flat final line: “though anything can happen any time.” Thankfully, such instances are rare, as poem after poem, Howard’s gifts for observation, introspection, and eloquence capture moments of insight without excising the messiness of life. A figment of a once and future longing. Would that it might sustain me or be gone. Would that I might pass and leave no trace. 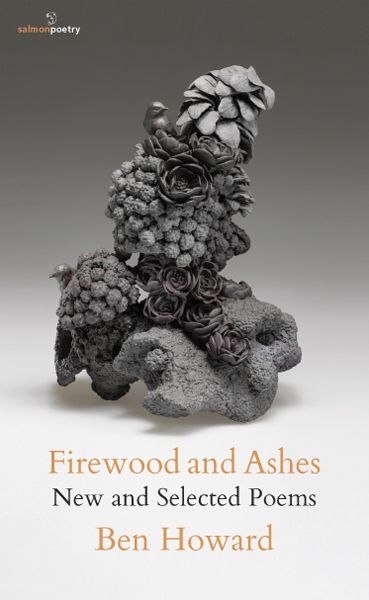 Howard’s restless spiritual searching, free from judgment and informed by Zen practice, unifies Firewood and Ashes. His poems are notable and noble in their craft, heart, and panoramic gaze. For a half-century now, he has written poems with one foot in the Romantic tradition and the other firmly planted in our modern predicament. His verse participates in the eternal search for truth and beauty amid our contemporary struggles, yet resists vernacular speech, excessive ironizing, and pop-culture allusions as devices to hold our attention. One hopes this representative gathering of poems old and recent will allow a new generation of readers to discover Ben Howard’s lush wisdom—a wisdom rooted in the poetic tradition and attuned to our fraught young century. Adam Tavel won the Permafrost Book Prize for Plash & Levitation (University of Alaska Press, 2015). His recent reviews appear in The Georgia Review, Rain Taxi, The Chattahoochee Review, and CutBank Online, among others. You can find him online at http://adamtavel.com/.